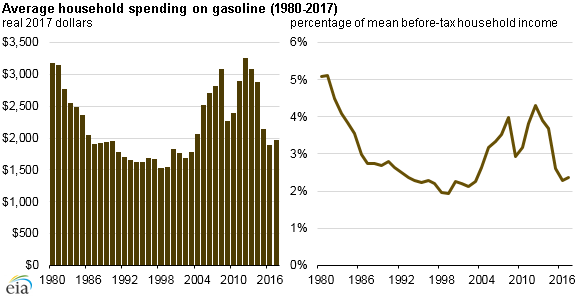 The average U.S. household expenditure on gasoline in 2017 is expected to total $1,977, or approximately 2.4% of mean incomes of households, according to projections in EIA’s most recent Short-Term Energy Outlook (STEO). The most recent peak for household gasoline expenditures was $2,715, or 4.0% of household income, in 2008. More recently, average household gasoline expenditures in 2015 and 2016 were near or below $2,000, or 2.5% of total household income. Household gasoline expenditures have fluctuated over the past 10 years as a result of changes in gasoline prices and consumption. When gasoline prices are relatively high, more of a household’s income is devoted to gasoline expenditures, leading to lower gasoline consumption and efforts to improve vehicle fuel economy. Declines in gasoline prices since 2012, however, have led to increases in vehicle travel and increases in gasoline consumption. Based on EIA’s latest STEO projections, continued low gasoline prices are expected to lead to record-high gasoline consumption of 9.3 million barrels per day for 2017. Lower gasoline prices have contributed to decreasing household gasoline expenditures since 2012, as gasoline consumption has generally increased. STEO estimates that gasoline prices will average $2.48 per gallon in 2017, which is 33% lower than the price in 2012.